LeBron James scored 46 points in the Cleveland Cavaliers' 109-99 victory over the Boston Celtics in Game 6 of the Eastern Conference Finals on Friday night. 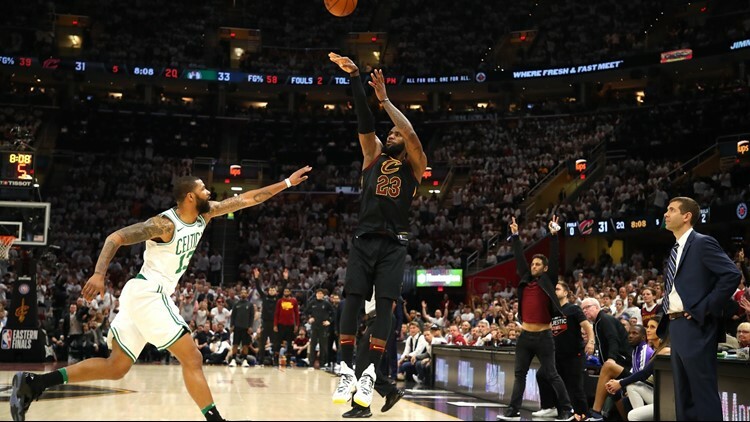 CLEVELAND -- After the Cleveland Cavaliers fell behind Boston Celtics three games to two in the best-of-seven Eastern Conference Finals on Wednesday night, one narrative emerged in the hours leading up to Friday night's Game 6. Not only were the Cavs facing elimination, but the contest could very well mark LeBron James' final home game in Cleveland. The subject filled radio segments and columns, video essays and tweets. And while we won't know for weeks whether or not James' time in Cleveland will come to an end when he can opt out of his contract this summer this summer, the 4-time MVP has secured at least one more game wearing wine and gold. With his team's season on the line, James turned in the type of masterful performance that has become commonplace in his already storied career. 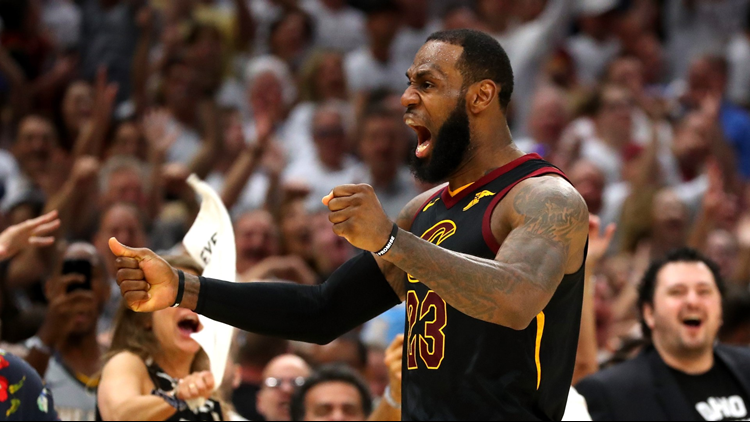 Scoring 46 points, grabbing 11 rebounds and dishing out 9 assists, James led the Cavs to a 109-99 victory over the Celtics on Friday, forcing a Game 7 in Boston on Sunday with an unprecedented eighth straight trip to the NBA Finals now one win away. "Greatness. Championship pedigree," Cleveland head coach Tyronn Lue said of his star player's performance. "Gave it his all. We needed that, especially with Kevin going down. He delivered. He carried us home as usual." Entering Friday, James already possessed the highest scoring average in games with his team facing elimination in NBA history and had recorded either a triple-double or 40-point effort in each of his previous six -- now seven -- outings with his season on the line. There was something different -- almost emotional -- however, about his effort on Friday in a game in which his co-star, Kevin Love, played in just five minutes due to a first-quarter collision. On one possession, early in the third quarter, James finished a fast break with a layup, only to rush back on defense and deliver one of his signature chasedown blocks against Celtics guard Terry Rozier. Late in the fourth quarter, he sealed the game with a pair of step back 3-point shots 42 seconds apart -- the latter of which he celebrated with an emotion-filled outburst. "The love of the game causes reactions like that," James said. "Understanding the situation and the moment that you're in and just a feeling you can't explain unless you've been a part of it." The situation he'll find himself in on Sunday won't be all that different -- aside from the game being played in Boston, where the Cavs have yet to win this postseason. Nevertheless, talk of James' future is now on hold -- not that it will take long to start back up should the Cavs come up short in Game 7. But if Friday was in fact James' final home game in Cleveland, he left Northeast Ohio with a performance for the ages to remember him by.